The Sahel countries currently face huge challenges. They have to cope with the effects and risks of climate change, growing population pressure, a security crisis in some regions, a strong urban dynamic leading to the redefinition of the relations between urban and rural areas and calling for significant investment in infrastructures, etc. there are many cases of tensions between communities. While in general, the population of the Sahel generally benefits from sufficient agricultural production, access poses a problem, resulting in recurrent under- or malnutrition. Human development indicators are among the lowest in the world. However, many technical and organizational innovations generated by research to benefit development, already exist. It is therefore vital to continue those efforts and above all to step them up and coordinate them more efficiently, aiming to upscale their impact on beneficiaries. 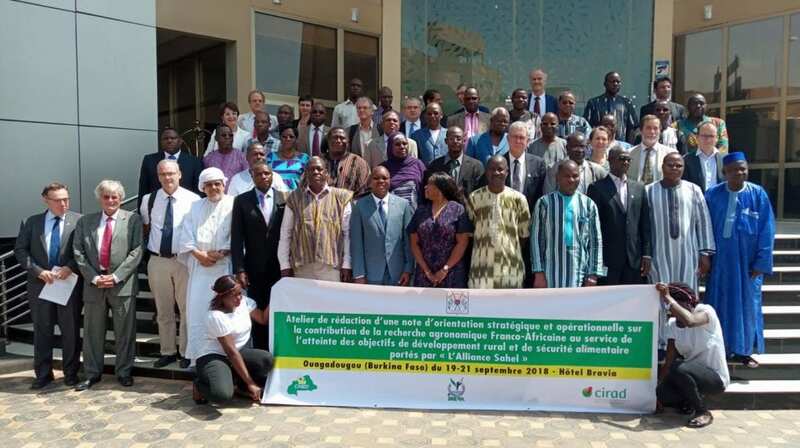 It was this ambition that prompted CIRAD and the national agricultural research institutions of the Sahel countries to sign the Ouagadougou Declaration* on 21 September 2018. The declaration fits into the framework of the Sahel Alliance launched in July 2017 by France and Germany. The Alliance set out to build an international cooperation platform to foster development in the Sahel. It should enable more efficient coordination of initiatives, and boost the support provided by development partners in the region. there can be no long-lasting peace or security in the Sahel without rural development that generates employment; research has to work with all the stakeholders concerned to build solutions; the agricultural research institutions of the G5 countries, along with Senegal, WECARD and CILSS, are responsible for strategic and operational proposals to policymakers and donors with a view to achieving the objective of sustainable development in the region; the region's future is one of the major priorities for scientific cooperation between Europe and Africa. To boost and upscale their operations, the signatories intend to pool their achievements – innovations, stakeholder networks, methodologies and participatory dynamics – and work together. This new approach should make it possible to speed up existing research and development projects and boost the impact of those projects. The aim will also be for research to make an effective contribution to the definition, implementation and success of new development projects. Managing habitats and natural resources in such a way as to optimize biomass and renewable energies and biodiversity . Rolling out sustainable, healthy food systems capable of guaranteeing food and nutritional security . Contributing to building stakeholders' skills and consolidating research, innovation and agricultural and rural training institutions. For the Declaration's signatories, these priorities are vital in ensuring that successful development meets history. The Sahel Alliance is an initiative launched in July 2017 by France and Germany, which currently associates nine players: France and Germany, the European Commission, the African Development Bank (ADB), the United Nations Development Programme (UNDP), and, more recently, Italy, Spain and the UK. The aim is to build an international platform for cooperation in favour of development in the Sahel, to enable more numerous and more efficient operations. The Sahel Alliance should enable more efficient coordination of initiatives, and aims to improve the support provided by development partners in the region. To this end, the Sahel Alliance works in six priority sectors: youth employment, rural development and food security , energy and climate, governance, decentralization, access to basic services, and security. On 13 April 2018, in Ouagadougou, the Minister of the Economy, Finance and Development in Burkina Faso, Ms Hadizatou Rosine Coulibaly, chaired the launch workshop of the Sahel Alliance, which she called a "Marshall Plan" for the Sahel.